My husband, Christopher, and I tend to share bags when we go on smaller trips. Sharing saves us room and I have definitely learned to pack lighter over the last few years. For example, this weekend, when we go to Savannah to celebrate my older sisters birthday, we will definitely be sharing a bag. Not just luggage wise, but also toiletries wise. As soon as this REVISIT Dopp Kit, making the perfect travel bag, came in the mail my husband's reactions were instantly "Is that for me?" and "I love it!". It really is a neutral bag for men or woman and is the perfect travel size, not too oversized, but not too small. The leather really sets it off. This REVISIT bag was 100% hand sewn by the craftsmen at the company in LA. They use vegetable tanned leather and antique copper zippers. It is the best feeling in the world to be supporting a fellow small business, as my husband and I are both entrepreneurs as well. 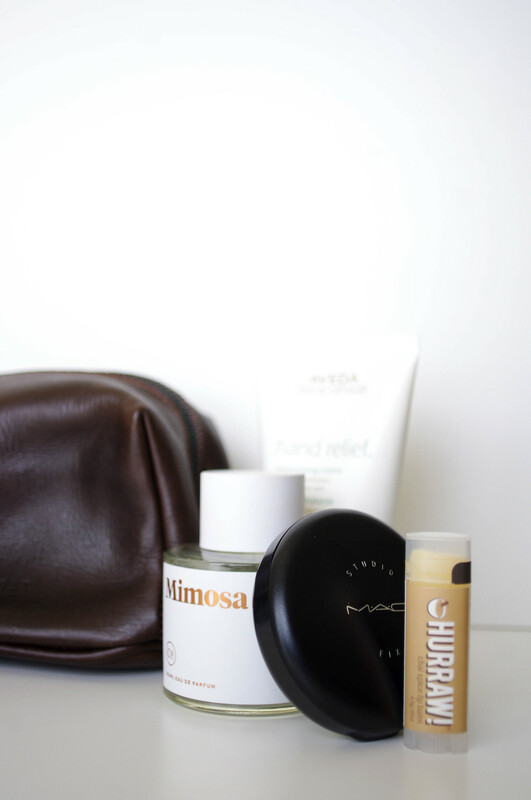 The routine shown in the images below feature our favorite products from our daily routine. We both love our Commodity Goods Cologne and Perfume. If you haven't looking into their scents, you will be pleasantly surprised when you do. My favorite scent is Mimosa and my husband's favorite scent is Moss. Christopher also likes to use his Honest Amish beard balm, his Watermint Gin Blind Barber face wash, and his dental floss regularly. I like to use my Aveda hand cream, MAC studio fix, and my favorite Chai Spice lip balm from Hurraw! I hope everyone has a beautiful start to their week!